Create a new reaction equation, by clicking on the New button on the tool bar. At this moment there is not enough room for all reagents, so click once on the add reactant button and once on the add product button. After this operation you are ready to enter reagents for equation balancing. Simply enter formulas in the upper, input frame, into the formula edit fields. Whilst sometimes it is necessary to use some fancy techniques to properly format formulas (as described in program help), in most cases they are not needed - just enter HClO4, P4O10, H3PO4 and Cl2O7. Note that when you are entering formulas, molar masses of the reagents are calculated and displayed, saving you time and effort. Next step is... Oops, sorry, there is no next step. 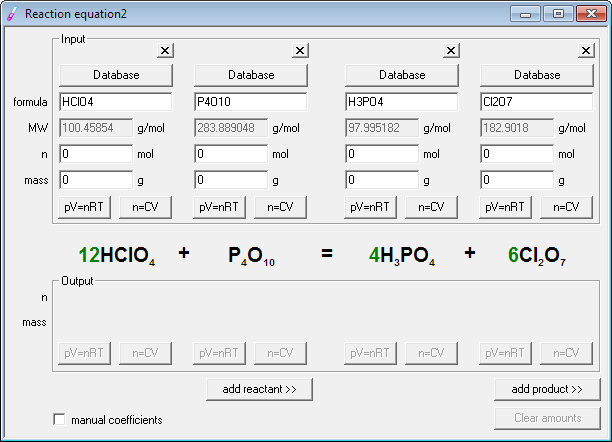 The equation is already balanced - all you have to do is to read the result in the middle of the dialog window. Balancing chemical equations was never as easy before! Balancing chemical redox equations and net ionic equations is also possible, as program balances not only atoms, but also charge. Balanced chemical equation can be exported through the clipboard for use in other applications. You may export the equation as TXT, as RTF (rich text format) for use in any wordprocessor, as HTML to put it on the website, as UBBC (universal bulletin board code) to post it on some forum or as LaTeX to use it in a LaTeX prepared paper. While you may already print out the reaction summary (assuming you are using registered version), we will look at the printout when discussing stoichiometry calculations.